The cut-and-cover of the M30 in a 5 mile strech that coincided with the Manzanares River in Madrid offered an opportunity, a frustrated opportunity in the past in various urban plans that had been made, to establish a network of open spaces that could superimpose an already consolidated urban structure. This project pretends to find clues that will allow the construction of a green structure in the inner part of the city but connected to the surroundings which in Madrid have to do with a fluvial geography on which the city is set up. 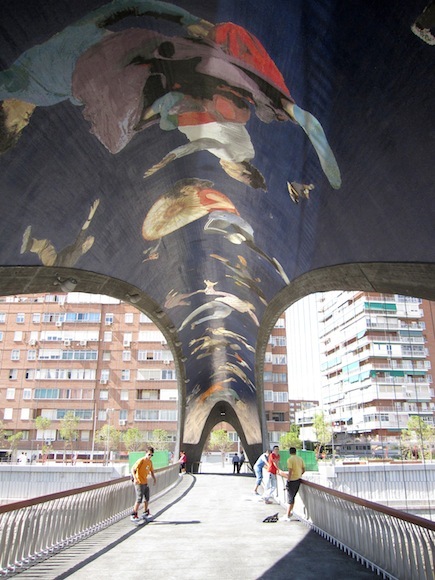 An “apparently natural” landscape is to be built on this artificial place, over the tunnels' concrete slabs, which will make people in Madrid dream about the fact that in reality there is continuity with the surrounding landscapes, “icons” of what we recognize as “natural”. Architects: MRIO Arquitectos (Burgos & Garrido Arquitectos, Rubio & Álvarez Sala Arquitectos, Porras & Lacasta Arquitectos), West 8 Urban Design and Landscape Architecture. Collaborators: Javier Malo, María Jesús Franco, Almudena Carro, Sergio del Castillo, Eduardo González, Juan Galbís, Elisa Lara, Agustín Martín, Juan José Mateos, Raquel Marugán, Emilio Ontiveros, Juan Tur, Samir Alaoui, María Ángeles Fernández, Carlos Fernández, Elena Garicano, Miguel Ángel López, Marina del Mármol, Gema Montañez, Víctor Muñoz Sanz, María Ortega, Susana Paz, Antonia Peña, Lucía Prado, Jonás Prieto, Ramiro Sánchez, Emma Simonsson, Elena Verdú.